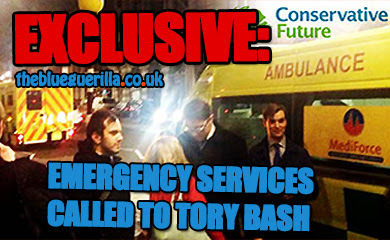 TheBlueGuerilla: EXCLUSIVE: Tory Activists Queue Up to Launch 'Anti-Clique, Anti-Bullying' CF National Executive Bids. EXCLUSIVE: Tory Activists Queue Up to Launch 'Anti-Clique, Anti-Bullying' CF National Executive Bids. A NUMBER of Conservative Future (CF) activists are set to launch "anti-bullying, anti-career politician, anti-scandal, anti-clique" internal election bids in the wake of the suicide of Tory activist Elliott Johnson, who left a note about bullies in the party. TBG can exclusively reveal the rumours of a possible challenger to the CF chairmanship favourites Stephen Canning and Luke Springthorpe. Overheard at last nights’ Pint and Patter with Conservatives for Liberty, a relatively unknown "with a pint in hand," was telling others they planned to run in the forthcoming elections "on an anti-bullying, anti-career politician, anti-scandal, anti-clique ticket." TBG can guess this will only be welcomed with open arms following recent events. Although the activist was not named to TBG, this blog has been told they "will be in attendance at Conservative conference in Manchester" and will be "secretly picking up support." 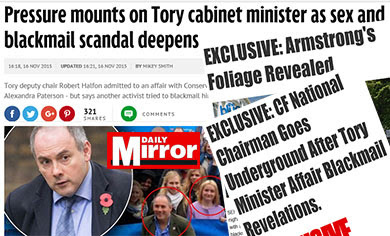 They went on to say the Tory supporter was "proposing uploading all personal attacks during their bid to their campaign website to show members just how bitchy the youth wing has got." With support for the favourites heavily split and recently damaged, TBG believes this runner could well be in with an outside shot. 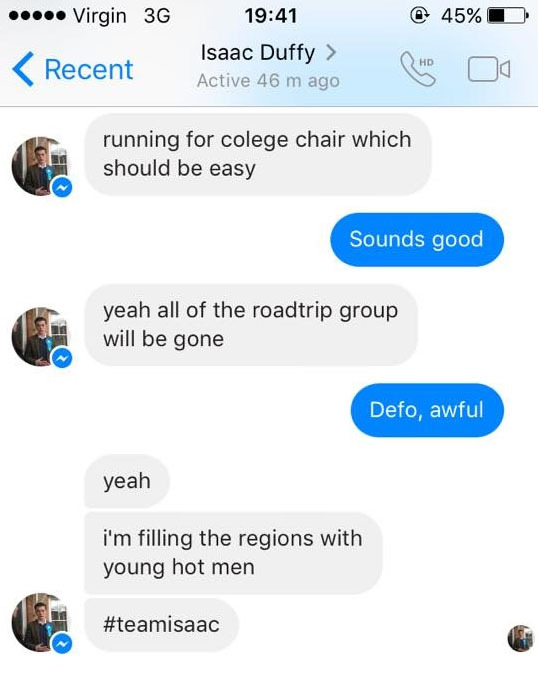 Well known activist Issac Duffy reckons running for chair' "should be easy" as "all of the Roadtrip group will be gone". He also has gracious plans for the regions as this leaked conversation shows us (left). Popular activist Liam Walker is also understood to be eyeing up the top CF National Executive post of Chairman and has been particularly vocal on the issue of bullying. Merseyside CF Area Chairman Emilio Chiquito exclusively told TBG: "Good to see some discourse developing in regards to the CF exec. I act as Merseyside Area Chairman for them and for far too long have I been embarrassed by the personalities that run this organization and the prevailing culture that was childish at best and incredibly harmful at worst. "The comment about the idea these sorts thinking they have a 'career in youth politics' really hits the nail on the head. There needs to be a shake up and some different people coming through the ranks. 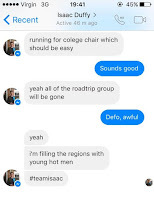 The current lot going forward on a joint RoadTrip/YBF billet was perhaps the most unhealthy thing that could have happened to this organisation. "The CF exec needs more diverse and representative people on it, it's not enough to shrug and say 'hey that's youth politics for you'." "an anti-bullying, anti-career politician, anti-scandal, anti-clique ticket"? Yeah right, they're all the same. There will be no change in CF, it'll be one bunch of morons taking over from the previous bunch of morons. Always has been, always will be! No. CF needs to be scrapped now and replaced, too damaged. Bit rich coming from Isaac Duffy. 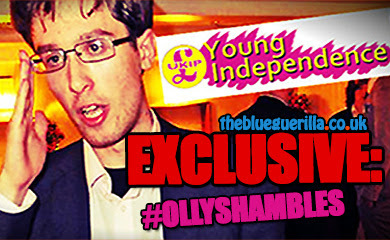 The guy genuinely believes he will become leader of the party. 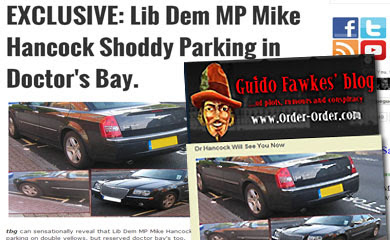 One of the most arrogant, manipulative, back stabbing individuals in local Teesside politics.